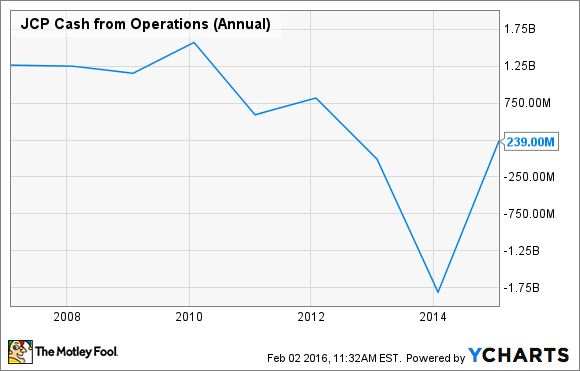 How Much Free Cash Flow Can J.C. Penney Produce? The next big leap forward for free cash flow at the retailer may not come until 2017. Last month, J.C. Penney (NYSE:JCP) tweaked its projections for the recently completed 2015 fiscal year. The company now expects to report positive free cash flow for the full year, compared to its prior guidance for breakeven free cash flow. J.C. Penney probably produced positive free cash flow last year. Image source: The Motley Fool. Maximizing free cash flow is a critical issue, as it would allow the long-suffering department store to pay down high-cost debt. This could catalyze a virtuous cycle of declining interest payments and rising cash flow, driving J.C. Penney stock higher. Cash flow has been a problem for J.C. Penney in recent years, following a failed strategy shift attempted in 2012 under former CEO Ron Johnson. J.C. Penney's cash flow had already started to decline prior to Johnson's arrival in late 2011, but its cash performance worsened dramatically in 2012 and 2013. In 2011, J.C. Penney produced operating cash flow of $820 million. In 2012, this fell to negative $10 million. Operating cash flow plunged again in 2013, hitting negative $1.81 billion that year. JCP Cash from Operations (Annual). Data by YCharts. These operating cash flow declines came just as J.C. Penney was increasing its capital expenditures in order to revamp its stores. Capex rose from $634 million in 2011 to $810 million in 2012 and $951 million in 2013. As a result, after producing a modest amount of free cash flow in 2011, J.C. Penney burned more than $3 billion in cash during the 2012-2013 period. J.C. Penney's cash flow improved dramatically in 2014. J.C. Penney continued to reduce its cost structure that year. Meanwhile, it expanded its gross margin from 29.4% in 2013 to 34.8% in 2014 by improving its merchandise mix and avoiding big losses on clearance merchandise. This allowed the company to reduce its pre-tax loss by about $1.1 billion year over year. J.C. Penney actually produced positive free cash flow of $57 million in 2014, up more than $2.8 billion year over year. The free cash flow performance outstripped its profitability improvement due to a $700 million cut in capex and a more than $1 billion improvement in working capital. Further cash flow improvements will be tougher for J.C. Penney. Through the first three quarters of fiscal 2015, the company narrowed its pre-tax loss by $250 million. Analysts expect further improvement in Q4. In fact, J.C. Penney is likely to post its first adjusted profit in several years when it reports its Q4 earnings later this month. J.C. Penney got its inventory back under control in 2014. Image source: The Motley Fool. However, J.C. Penney reduced its inventory by nearly $300 million in 2014, which bolstered its cash flow. By contrast, it has increased its inventory year-to-date to support higher sales. Higher sales levels should drive earnings growth over time, but in the short run, the inventory increases offset the cash flow benefits of higher earnings. This means that J.C. Penney's free cash flow probably didn't improve much in 2015. It may face an uphill battle in 2016 as well. J.C. Penney recently announced that it would test selling appliances in three markets. If this pilot program is successful, it will probably be expanded nationwide. That would entail higher capex to build out new appliance showrooms in hundreds of stores and higher inventory to stock these new departments. Both factors would pressure J.C. Penney's free cash flow. On the other hand, entering the appliance market could boost J.C. Penney's store productivity, leading to higher earnings over time. As a result, if the company opts for a major investment in the appliance market this year, investors should look to 2017 as the first year of significant free cash flow generation at J.C. Penney.